Jordan Accused Of Targeting Online Dissent : Parallels It's happened across the Middle East — and now it's happening in Jordan. The country's government has cracked down on news and other Internet sites. A new law requires those sites to be registered with the government and have a member of Jordan's press council on staff. Some are calling it another form of censorship. 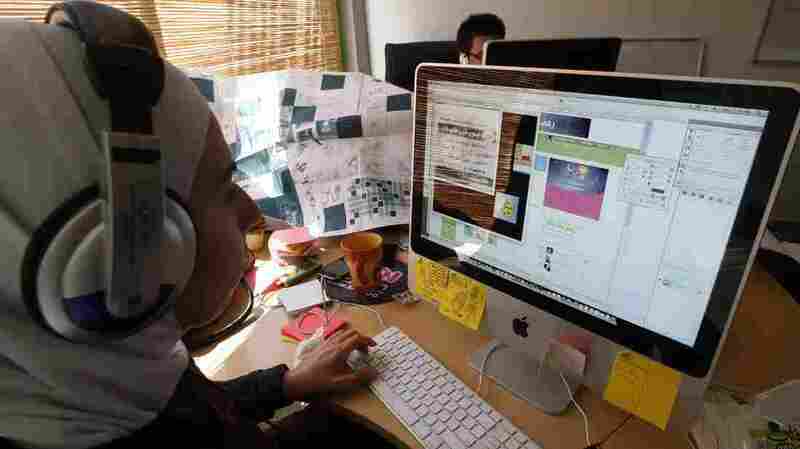 A Jordanian woman surfs the Web at an office in the Amman, Jordan, on Sept. 30, 2009. The country's government is under fire from media activists for blocking hundreds of websites across the kingdom. Jordan's King Abdullah vowed to make the desert kingdom a "free Internet" country as he began his rule more than a decade ago. On June 2, when local Internet providers were ordered to block hundreds of news websites across the kingdom, Web publishers protested the broken promise and international media watchdog organizations charged censorship. The protests are getting louder in Amman, as websites go dark across the kingdom, more than 300 in all. Government officials say the new law protects citizens against slander and blackmail on unregulated websites. The controversial new requirements include a government license; a member of Jordan's press council on staff, a group that excludes electronic media journalists; and site owners being responsible for all content, including commentary posted in open discussions. "The Internet is one of the only places that people have a voice that is outside of the gatekeepers of the government," said Daoud Kuttab, the founder of Amman.net, one of the blocked sites. He is a pioneer in Jordan's independent news culture, overseeing an electronic newsroom for more than a decade. He has joined other web publishers in an act of "electronic civil disobedience" by refusing to apply for a license. "Freedom of the press is something that Jordan and the king are trying to sell to the rest of the world," he says, but points out the country's major newspapers are owned by the government. The major private newspapers are "owned by businessmen who are totally in bed with the government, so where is independent media?" he asks. Kuttab charges that the new law is political, targeting online dissent. The government imposed the new regulations amid rising dissent. The list of complaints includes high-level corruption and a faltering economy as electricity prices are set to rise. Jordan has been on the frontlines of the Syrian conflict, hosting more than a half million refugees, straining the country's meager resources. The latest protests focus on the U.S. deployment of Patriot missile batteries, a squadron of F-16 fighter jets and more than 700 U.S. military personnel now based in Jordan. The White House described the deployment as protection against violent spillover from the war in Syria. The Web was one place where Jordanians could have a freewheeling discussion, much of it critical of government policy. The new regulations don't include Internet giants like Google and Facebook. They also don't touch Jordanian bloggers like Nassem Tarawnah. His website, 7iber.com, is a platform for open discussion and debate. He escaped the ban, but joined the protest against a government regulation he believes sets a dangerous precedent. "There is nothing to say that, a year from now, or two years from now, this is not going to affect a larger segment of the Internet," he says. We meet in a café where young customers pay for frothy cappuccinos and logon to the Web for free. Jordan leads the region in Internet penetration with more than half the country online. The Facebook generation, more than a million Jordanians are Facebook users, is young, well-educated and Web savvy. They bypass the country's traditional media and read news and commentary online, Tarawnah says. He believes the intricate laws and regulations aim to create a culture of self-censorship. "It's about pushing the offline culture of fear online," he says. He's already seen online opinion dry up on his site since the government imposed the block on specific sites. "It makes it even more difficult and challenging to get average people to say, speak up you can post it, it's safe, because that safety has kind of eroded," he says. Jordan's record on media freedom has been slipping for years, according to Freedom House, a U.S.-based organization that monitors media freedom around the world. The 2013 report card labels Jordan's media "not free" with a lower rating that Egypt, Tunisian and Libya. But government officials insist the new law protects citizens from dubious journalism. Some sites in Jordan have published damaging allegations about individuals or groups, and then offer to remove the charge for cash. Web editor Kuttab acknowledges there have been online abuses. "That's true – but that's the price of openness," he says. "You know, and if someone has actually broken the law and blackmailed people, put them in jail. Don't kill all the messengers using a machine gun just to get rid of a fly." Kuttab has joined a law suit against the government. Other Web publishers have called for a national campaign to break the blackout through technology. Young Jordanians are creating all kinds of software, said Kuttab, to get around the blackouts. "They are sending it around for free," he said, "people have reacted by trying to beat the system."